Aquila translates to Eagle, while chrysaetos translates to gold, which accounts for the goldish tuff on the Eagles neck. This domain is classified by the presence of a nucleus and membrane bound organelles, which the Golden Eagle’s cells contain. This is a very broad category. This kingdom’s organisms are multicellular and heterotrophic. They also lack a cell wall. This means the animal has a spinal chord. It is also classified in this category because of its three layers of tissue (triploblastic) and its lateral symmetry. The Golden Eagle also has a complete digestive tract, which is typical of animals in this category. This is a broad category of birds. These birds are all warm blooded with an exoskeleton of feathers. They have no teeth present, and they also have no sweat glands. This encompasses a wide range of birds, from the parrots of the tropics to the small native birds of the plains. Sharp beaks, raptor claws, and long wings for soaring flight are what put the Golden Eagle into this category. Others in this category include falcons and vultures. Birds of prey will broad wings the main characteristic is the presence of the cere. The cere is a waxy coat that is located on the mandible of the bird and used for the nostril openings. This encompasses all eagles and their species. Aquila is the Latin word for eagle. Chrysaetos is the Latin word for gold. The Golden Eagle got its species name because of the gold/brown tuff of feathers it has on the nape of its neck. This phylogeny shows a simplified version of the separation of species in the raptor family also based on the total nuclear and mitochondrial DNA similarities. 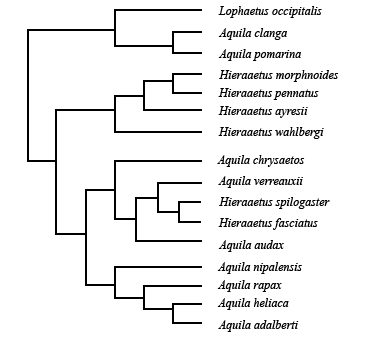 This tree contains a closer look at the extant members of the family Accipitridae (Helbig et al. 2009). Click on the very small tree on the right to enlarge this tree, and visit the link to the research which classified this eagle so it can be viewed in full size. Scroll to the body of the research article to view this tree and the extensive explanation. This is an evolutionary tree that shows the relationship of the family Accipitridae. Specifically what can be seen in the relationship based on mitochondrial cyt-b of the Golden Eagles to other similar raptor birds and vultures (Lerner and Mindell 2005). Read about Aquila chrysaetos interactions with other species, click here. Want to learn more about the bird species listed? Visit The Cornell Lab of Orinthology: All about Birds webpage.